3 x Smoked pork hocks brought to boil in a large saucepan. Water should cover the hocks. Simmer on medium heat for 1½ hours. Remove stock around the hock and score the skin then glaze. Keep some of the liquid stock to make a gravy with a slurry of bisto brown gravy and cornflour. 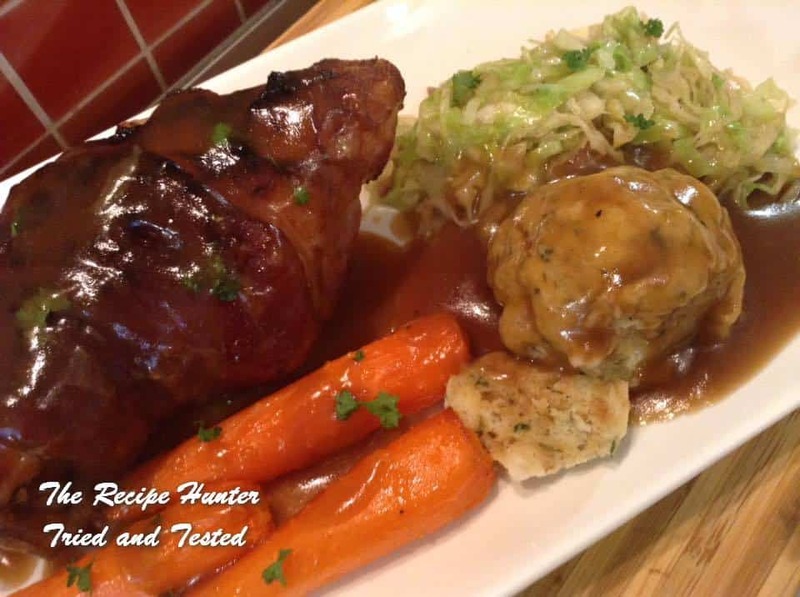 Glaze pork hocks then place on a baking tray and grill in oven for 15 to 20 mins. Add enough flour, start with 1/4 cup and mix until the liquid in the mixture has been taken up by flour. Adjust with milk or more flour as needed. Bring a pot of salt water to boil. Using wet hands roll dumplings into balls (tennis ball size) drop into boiling water and simmer for 15 to 20 mins. Double recipe if requiring more dumplings. Note: *Left-over dumplings, chop into cubes then fry and serve for breakfast with an egg whisked over.